There will be 20 "Beamed" Bioneers Conferences, many are still to come so see if one will be near you. If I had to sum up today’s Bionners Conference Plenary Session I would have to say that the message was to work from our heart. When our work is driven by passion and conviction it no longer feels like work, we seem to have unlimited energy and ideas, and somehow, it often feels as if assistance just “shows up” when we need it most. I am not implying that it is easy, sometimes we actually take on even more than we might if we were strictly motivated from our head. We go after what our heart is pulling us towards and contend with the details once we are already in the process. This is a new way to live our work, but this way is growing and today’s speakers were examples of this approach to life and work. 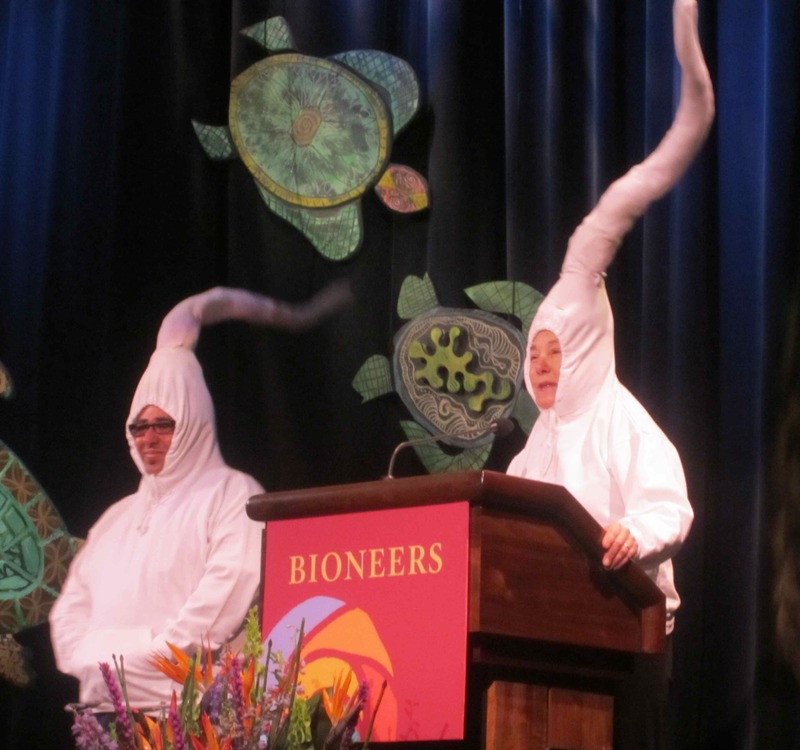 We heard from Kenny Ausubel about the ongoing activities of Bioneers beyond this conference. 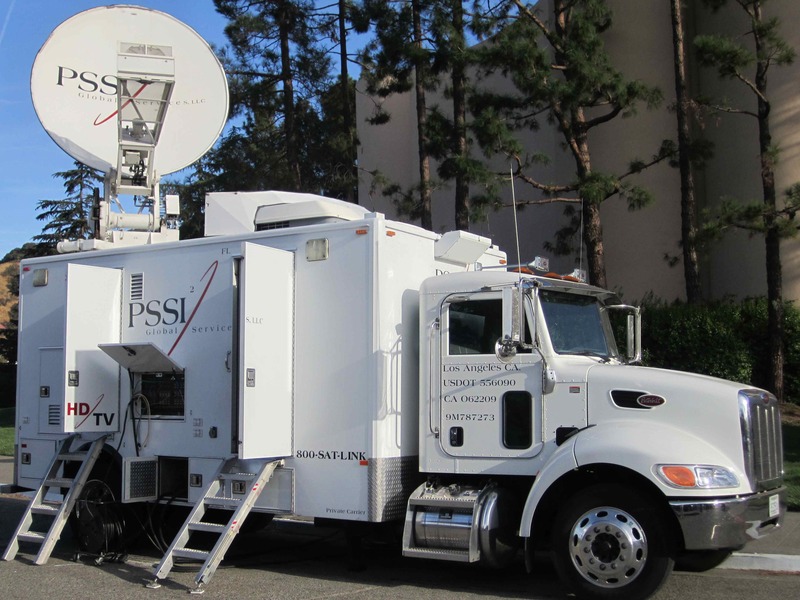 More partnering is taking place including working with National Geographic to bring the Bioneers message to even more people. There was a Bioneers Global Conference this year in Holland and already results are manifesting from this meeting. The collaborative project Dreaming New Mexico is growing and a methodology is being created so that other states can use this as a model. Kenny also reminded us that in the US most environmental education comes from the media. When I heard this I got a bit scared, but then I also experienced a deep understanding of how we got here. The good news is that if a lack of accurate information is partly how we got here then with better education we can get out of this situation. After Kenny we had a real treat to preview a short cut from Louis Schwatrzberg’s film Naked Beauty. This is a breathtaking film bringing us into nature in a way that few of us have probably ever experienced. The excerpt that we saw showed the crucial interdependence of plant and animal, and the magic and fragility behind that. Louis also spoke about the beauty of nature and how it touches the hearts of all of us, opening us to our connection with nature and our selves. The next speaker was a special treat. Elizabeth Kapu’uwailani Lindsey is a woman of elegance and great wisdom. She spoke of how as a society we are overloaded with information yet starved for wisdom…more connected yet more lonely. What is it that is causing so much inner suffering, that is then reflected in a world with so much outer suffering. One answer is that most of us have lost the wisdom to know that everything is sacred. With this knowledge all that we do and experience takes on a new dimension. It is time to shake ourselves out of society’s stupor because we have important work to do. She invited all of us to rise and be fierce in our work together, recognizing that this is our prelude to greatness. I must confess that even though I live most of the time in Santa Fe and had heard about the Dreaming New Mexico project I really did not know what it was so learning about it from Peter Warshall this morning was especially interesting for me. I love that this is in fact a project where participants were asked to dream, and dream big. What was posed was the following: What would New Mexico look like if an ideal, sustainable system was implemented, based on the reality of the land and natural conditions? The first hurdle encountered was to truly dream this since most of us live with a reality that prepares us to work for what we think we can attain, rather than all that we would like to manifest…and this applies in every area of our lives. Perhaps this is really the jumping off point that we need to shift in making this paradigm change to create a sustainable future. We need to look at what is really possible, rather than what we think might be accepted. Dreaming New Mexico is already partnering to help make policy changes and implementing programs to accomplish this dream. I would encourage you to look at the web site since the program involves food, energy and much more. It takes into account the wisdom and experience that the past holds for us. This is also a crucial point that Elizabeth Lindsey made in her inspiring talk-we must preserve the knowledge of the elders, in all societies, for it quite likely holds many answers to our survival since the ancient ways have been around a lot longer than our modern ways. Peter was followed by the Destiny Arts dance troop and there were a lot of us who had trouble staying in our seats. The center was founded in 1988 in Oakland, California. “Destiny’s mission is to address the direct correspondence of increasing crime and violence to the declining existence of safe, accessible after-school activities in Oakland.” By providing more than just a safe haven for these youth their lives are being fundamentally changed. Their performances address important social issues combined with dance and music. If you have a chance to see them or an opportunity to work with them I would encourage you, it will be inspiring and heartwarming. And on the subject of transformation, Mary Gonzalez’s story is just that, as well as the work that she does. She addressed the impact of alienation that so many of us feel. Alienation from ourselves, our neighbors, our world and the powerlessness that this brings. Mary is the California Director of the Gamaliel Foundation whose mission is to assist community leaders to create grassroots organizations so that ordinary people can impact “the political, social, economic and environmental decisions that affect their lives.” It is hard to imagine this powerhouse of a woman ever doubting her abilities as she spoke of the importance of reconnecting people to themselves and their world to empower them to take positive action. She also reminded us that social justice and environmental issues are inextricably connected and that in uniting them we will be a more powerful force to create positive change. It is time to look more at what unites us rather than what divides us. Mary was followed by an unusual pair…two large sperm who came to send out an SOS…that is, Saveoursperm.com (who says that we can’t have fun while doing our work). More and more evidence is pointing to the realtionship of toxic chemicals and reduced sperm counts not only in animals but in humans. Alternatives to these toxic substances exist and it is time to let out legislators know that we want them and will no longer be guinea pigs in this chemical experiment. Please visit the web site and you will be able to ask your member of Congress to co-sponsor the Toxic Chemicals Safety Act of 2010 (HR 5820), the strongest toxics reform bill ever introduced. It is time to dream big and really ask for what we want and what is needed. No surprise, our next speaker was John Warner, an accidental chemist and co-author of Green Chemistry-Theory and Practice. He is far from the picture that I have of a chemist and he told us the first question that we must ask if we want to get rid of toxic chemicals and it is, why are these chemicals in products in the first place? Do you know that chemists never have to take a class in toxicology or in understanding the mechanisms that create illness? They just learn how to create new substances…new chemicals. The more creative ones like John get paid to have a field day creating, but they never are taught about creating safe chemicals. There is no funding in our country for green chemistry while China has fourteen laboratories dedicated to this, and in India chemists must take green chemistry classes. These countries recognize the growing demand for green products and it is up to us to demand these products in the US and that will help to create change here as well. For John it took having his child die at two years old to begin questioning the system that he was inside. Let’s stop killing ourselves and our loved ones, being exposed to the toxic chemicals that are all around us. We must become more knowledgeable so that we can recognize what is safe and let our shopping dollars speak for us. What we demand as consumers can change the market. Andy Lipkis the founder of TreePeople was our final speaker. I had never heard Andy speak before and his level of enthusiasm after forty years of work has only grown, like the trees he has been planting since he was 15. It is obvious that he loves what he does and the ways that TreePeople is making a difference is far more than I ever expected. Planting trees, and perhaps on occasion hugging them, is just the beginning. In talking about the many crises that we face as humans it is often said that the earth will survive without us, but Andy challenged us to question this…What if the earth really needs us as much as we need the earth. Andy spoke of many myths that can keep us from taking acting such as the myth that we just aren’t smart enough, or have the will to come up with solutions, or that Americans will never change their ways. The reality is, these are only myths and could not be further from the truth. One project that TreePeople was instrumental in was the planting of trees along Martin Luther King Blvd. in Los Angeles. One volunteer came up with this vision, and created a plan to involve the city and other participants. There was interest, but also a very long time frame to actually do it. In one day, in four hours, seven miles were planted by 3,000 volunteers. Another huge success story is the transformation of Elmer St, a neighborhood that was always flooding when it would rain, yes, it really does rain in Los Angeles. You can read about it here but I will just add that this project transformed a neighborhood and the people living there by taking a holistic approach to the problem. So much more emerged than just solving the flooding issue. Andy emphasized that his work is far from selfless and that in fact he receives so much in return for what he does. We too can experience this by asking where am I needed and how can I help…taking such action is a reminder that any seemingly selfless act has its own, often more significant rewards. It was a morning filled with heart from beginning to end. We may be facing some very serious issues and when we can remain firmly connected with our hearts while looking for solutions we will find the energy and resources to overcome what may at first glance seem to be insurmountable; we then will discover that obstacles are really opportunities for more growth. The more we let love rather than fear be our guide, the more we will be able to accomplish. For updates throughout the day follow me on Twitter. You will also find these posts at Ecoversity. 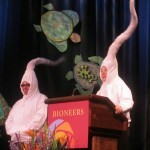 You can see the Beaming Bioneers schedule here, there will be 12 over the next weeks and months.